Having read mostly young adult and middle grade books for the last ten years has put me at a disadvantage when it comes to adult books. There are many classics that I just haven't read. 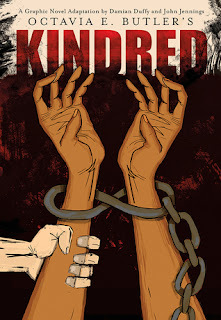 I was excited to see the graphic novel adaptation of Octavia Butler's Kindred on Net Galley, as a way to get the story without sacrificing the school-related reading that helps me do my job well. I'm so happy that this book has been made available in graphic novel format, as I think it will open up the important story to a wider audience. Dana, our protagonist, continues to be dragged from her life in 1976 to the Maryland during the slavery era. There, she must rescue the life of Rufus, a slaveowner and her distant relative. This continues many times: Dana is stuck in the past until almost dying jolts her back to modern life, only to be drawn back to the past when Rufus' life is threatened. She wonders if Rufus' death will lead to her freedom, and what other consequences there may be. It is so important for people to learn about slavery and the brutality of the United States' history. Addressing it via science fiction in a graphic novel form opens up the topic and text to many people. This is too mature for my sixth graders, but I think it would be an incredible addition to a high school curriculum and would inspire students to read more of Butler's work. I know it has inspired me.